You all know what an “elevator speech” is, right? The little pitch you make at a meeting when you’re asked to stand up and tell who you are and what you do. But have you ever looked at the economic difference between a decent elevator speech and an UNFORGETTABLE one? 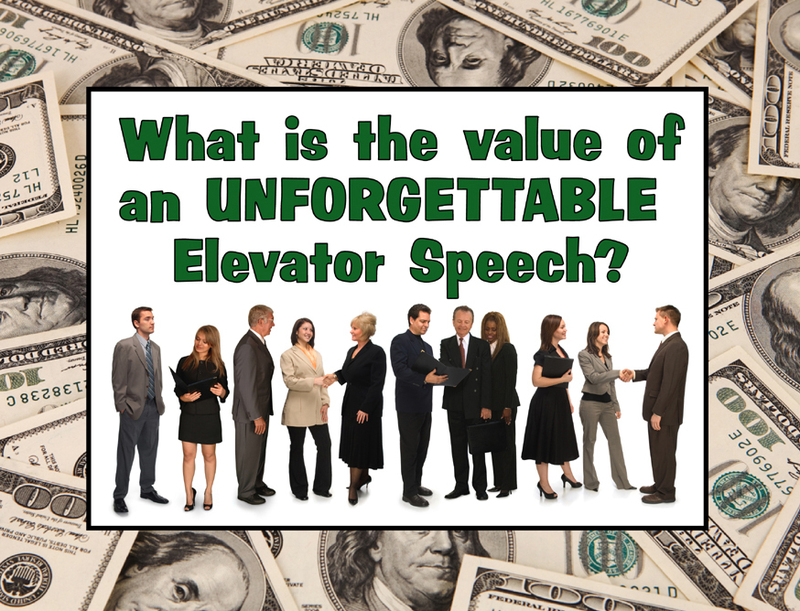 First, how much are you already spending on elevator speeches? You don’t think your time is worth zero, do you? So if you value your time at $50 an hour, and you go to a networking event twice a week, when you include an hour of travel time, and two hours of meeting time, you’re spending $300 a week just for the privilege of meeting fellow businesspeople and pitching your business, either one on one with some old fashioned hand shaking, or in front of the entire group with a 30-60 second elevator speech. Second, how much can you make with a single successful contact? If your average sale is $1,000 and an existing customer will repeat five times a year, each sale is worth $5,000. How many sales do you make from your networking efforts? One a week? Two? Feel free to fill in your own numbers. So let’s be honest. How are you doing? How many people do you talk with at a networking meeting one on one? When you finally stand up and give your pitch to the entire group, how many people do you think actually listen to you? How many come up to you after the meeting is over and ask for a meeting? And finally, how are your fellow networkers doing? When they stand up, introduce themselves and tell you about their business, do you remember ANYTHING they’ve said once they sit down? It’s pretty obvious that, for most business people, if they can double or triple their networking results they can add tens of thousands of dollars per year in sales. CLEARLY understand what your business does and how it helps your clients. If you have a unique business, you need to explain your new concept quickly and clearly. If you’re in a more common business, (realtor, financial planner, marketing consultant) you need to explain how YOUR approach is different. Distill your talking points and prioritize them according to the time you have – 30, 60 or 90 seconds. Perfect your delivery, so you can be heard and understood clearly, even in a crowded, noisy room. All that is fine and makes perfect common sense. There are scores of books that tell you how to do this. The true difference is making your elevator speech UNFORGETTABLE. When you sit down, people remember your name, your business, and what you can do for them. After the meeting is over your qualified buyers walk up to you and ask for a meeting, or you might make a sale on the spot! I will be conducting a two-hour intensive elevator speech workshop, at 1pm on October 21st at the new Microsoft Store in South Park Mall. If you have no elevator speech, I’ll teach you how to come up with a good one. Once you have a good elevator speech I’ll show you how to deliver it better. And once you have a well-delivered speech I’ll show you how to make it UNFORGETTABLE. In two hours you’ll develop and PRACTICE your elevator speech in a constructive, supportive environment. No public speaking skills are required or even needed. People will remember your name, your business, how it can help them, and the types of people they can refer to you. For more details go to http://www.unforgettablespeech.com/workshops-and-seminars/. Hurry, the class size is limited to 15 people and it’s filling up fast. Posted in Uncategorized | Comments Off on What is Your Elevator Speech Worth?